I've got TWO finishes to share this week! Whoop! And a new quilty goal for 2017. First up is my 2016 Stash Bee quilt. I asked my beemates to make a spool block for me with a mix of strings and novelty fabric. They did an AMAZING job. They shared some precious fabrics and went above and beyond even sending me extra blcoks. This menat that I was able to make a HUGE quilt. so big that I cannot get the whole thing in a single shot without my trusty quilt holders. LOL! And the quilting is perfect! I wanted quilting that looked like spilled thread unspooling all over. Nailed it! Thank you Cyndi! And it is LABELED! Which means it is really, really done. This leads me to my 2017 quilty goal. LABEL ALL THE QUILTS! My goal this year is to label every new quilt I make and to go back and add labels to all of my old quilts. Some will be fancy and some will just be a signature right on the quilt. Excited to get started on that. My second finish is this cute little scrappy quilt called Sweet Love. Perfect for Valentine's Day! It was a great way to use some stash. I picked purply-pinks for crosses and for the bsackground a white with tiny gold pluses. Love it! And I had yards of this simply perfect Heather Ross fabric for the backing. And one with a funny story.. So, one of my very first quilts, the one I consider to be my first REAL quilt, with an intricate pattern and small pieces was made for my husband. I even hand quilted the whole thing with tiny stitches. I was very proud of that quilt and he loved it. BUT, he has also always called it his "kneecap quilt" because it is quite small. LOL! He has given me quite a hard time over the years about some of the giant quilts I've made and compared them to the tiny quilt that is his. So, this year I made a quilt just for him and this was the label. He laughed AND he got a little teary eyed. It was a success. And that cemented my desire to LABEL ALL THE QUILTS. Because they really do all have a story. Very pretty quilts! I love spool quilts and am making a mini one right now. Yours is very colorful. How big are the spools? The plus quilt is adorable too. I love all the shades of pink. You must have a nice stash. Congrats on the finishes! Congrats! 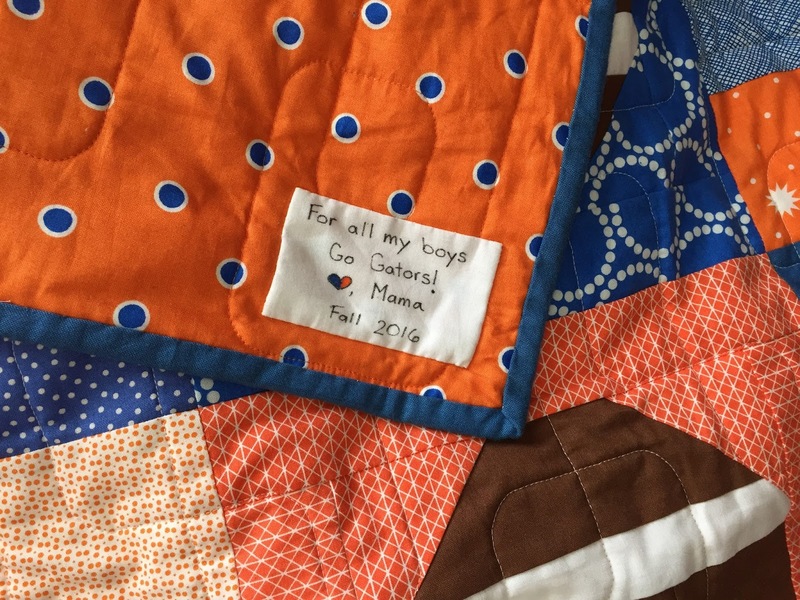 on your finishes AND your quilt labels!! Wonderful finishes and thanks for the reminder to label our quilts. I never do but should. Wow, congratulations on two fabulous finishes! My finishes are two years apart and you show two in one day! 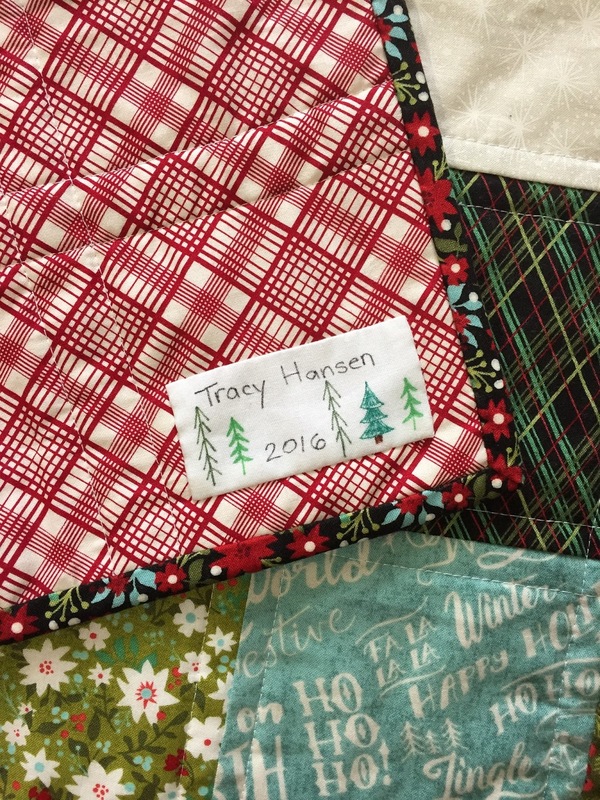 Love that you are labeling your quilts. I do think you should put your name on all of them though, since people might know which Mama and Mrs. Wonderful you are referring to. I like the special touches you add to the labels with the drawings. Fantastic finishes, love that label. I love your spools quilt - and your pretty pink plus quilt. Yes, you have to keep up with the labels! I adore your Sweet Love - what a timely finish for Valentine's. And your label for your hubby's quilt is fantastic, you have a super sense of humour! Beautiful quilts! I love both, especially the spools! great colorful work. We have a great collection of African fabrics. Colorful and best quality at lowest price. For whole sell price Visit us, hope you guys love them.